Not to be confused with Blackstone Group. This article is about the investment management corporation. For other uses, see Black Rock (disambiguation). BlackRock, Inc. is an American global investment management corporation based in New York City. 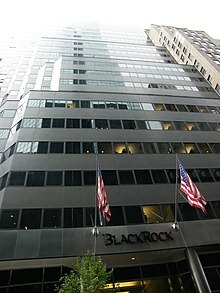 Founded in 1988, initially as a risk management and fixed income institutional asset manager, BlackRock is today the world's largest asset manager with $6.5 trillion in assets under management as of April 2019. BlackRock operates globally with 70 offices in 30 countries and clients in 100 countries. Due to its power and the sheer size and scope of its financial assets and activities, BlackRock has been called the world's largest shadow bank. BlackRock headquarters in Midtown Manhattan, New York City. BlackRock was founded in 1988 by Larry Fink, Robert S. Kapito, Susan Wagner, Barbara Novick, Ben Golub, Hugh Frater, Ralph Schlosstein, and Keith Anderson to provide institutional clients with asset management services from a risk management perspective. Fink, Kapito, Golub and Novick had worked together at First Boston, where Fink and his team were pioneers in the mortgage-backed securities market in the United States. During Fink's tenure, he had lost $100 million as head of First Boston. That experience was the motivation to develop what he and the others considered to be excellent risk management and fiduciary practices. Initially, Fink sought funding (for initial operating capital) from Pete Peterson of The Blackstone Group who believed in Fink's vision of a firm devoted to risk management. Peterson called it Blackstone Financial Management. In exchange for a 50 percent stake in the bond business, initially Blackstone gave Fink and his team a $5 million credit line. Within months, the business had turned profitable, and by 1989 the group's assets had quadrupled to $2.7 billion. The percent of the stake owned by Blackstone also fell to 40%, compared to Fink's staff. By 1992, Blackstone had a stake equating to about 35% of the company, and Schwarzman and Fink were considering selling shares to the public. The firm adopted the name BlackRock in 1992, and by the end of that year, BlackRock was managing $17 billion in assets. At the end of 1994, BlackRock was managing $53 billion. In 1994, Blackstone Group's Stephen A. Schwarzman and Fink had an internal dispute over methods of compensation and over equity. Fink wanted to share equity with new hires, to lure talent from banks, unlike Schwarzman, who did not want to further lower Blackstone's stake. They agreed to part ways, so the BlackRock partners (Sue Wagner) orchestrated a deal to sell part of the company. In June 1994 Blackstone sold a mortgage-securities unit with $23 billion in assets to PNC Bank Corp. for $240 million. The unit had traded mortgages and other fixed-income assets, and during the sales process the unit changed its name from Blackstone Financial Management to BlackRock Financial Management. Schwarzman remained with Blackstone, while Fink went on to become chairman and CEO of BlackRock Inc. In 1998, PNC’s equity, liquidity, and mutual fund activities were merged into BlackRock. BlackRock went public in 1999 at $14 a share on the New York Stock Exchange. By the end of 1999, BlackRock was managing $165 billion in assets. BlackRock grew both organically and by acquisition. In August 2004, BlackRock made its first major acquisition, buying State Street Research & Management's holding company SSRM Holdings, Inc. from MetLife for $325 million in cash and $50 million in stock. The acquisition raised BlackRock's assets under management from $314 billion to $325 billion. The deal included the mutual-fund business State Street Research & Management in 2005. BlackRock merged with Merrill Lynch Investment Managers (MLIM) in 2006, halving PNC's ownership and giving Merrill Lynch a 49.5% stake in the company. In October 2007, BlackRock acquired the fund-of-funds business of Quellos Capital Management. The U.S. government contracted with BlackRock to help clean up after the financial meltdown of 2008. According to Vanity Fair, the financial establishment in Washington and on Wall Street believed BlackRock was the best choice for the job. In 2009, BlackRock first became the No. 1 asset manager worldwide. In April 2009, BlackRock acquired R3 Capital Management, LLC and took control of the $1.5 billion fund. On 12 June 2009, Barclays sold its Global Investors unit (BGI), which included its exchange traded fund business, iShares, to BlackRock for US$13.5 billion. Through the deal, Barclays attained a near-20% stake in BlackRock. In 2010, Ralph Schlosstein, the CEO of Evercore Partners and a BlackRock founder, called BlackRock "the most influential financial institution in the world." On 1 April 2011, BlackRock replaced Genzyme on the S&P 500 index. In 2013, Fortune listed BlackRock on its annual list of the world's 50 Most Admired Companies. In 2014, The Economist said that BlackRock's $4 trillion under management made it the "world's biggest asset manager", and it was larger than the world's largest bank, the Industrial and Commercial Bank of China with $3 trillion. In May of the same year, BlackRock invested in Snapdeal. In December 2014 a BlackRock managing director in London was banned by the British Financial Conduct Authority for "not being a fit and proper" person, because he paid £43,000 to avoid prosecution for dodging train fares. BlackRock said: "Jonathan Burrows left BlackRock earlier this year. What he admitted to the FCA is totally contrary to our values and principles." At the end of 2014, the Sovereign Wealth Fund Institute reported that 65% of Blackrock's assets under management were made up of institutional investors. By June 30, 2015, BlackRock had US $4.721 trillion of assets under management. On August 26, 2015, BlackRock entered into a definitive agreement to acquire FutureAdvisor, a digital wealth management provider with reported assets under management of $600 million. Under the deal, FutureAdvisor would operate as a business within BlackRock Solutions (BRS). BlackRock announced in November 2015 that they would wind down the BlackRock Global Ascent hedge fund after losses. The Global Ascent fund had been its only dedicated global macro fund, as BlackRock was "better known for its mutual funds and exchange traded funds." At the time, BlackRock managed $51 billion in hedge funds, with $20 billion of that in funds of hedge funds. In March 2017, the Financial Times announced that BlackRock, after a six-month review led by Mark Wiseman, had initiated a restructuring of its $8bn actively-managed fund business, resulting in the departure of seven portfolio managers and a $25m charge in Q2, replacing certain funds with quantitative investment strategies. In May 2017, BlackRock increased its stake in both CRH plc and Bank of Ireland. By April 2017, iShares business accounted for $1.41tn, or 26 percent, of BlackRock's total assets under management, and 37 percent of BlackRock’s base fee income. In April 2017, BlackRock backed the inclusion of mainland Chinese shares in MSCI’s global index for the first time. Between October and December 2018, BlackRock's assets dropped by US$468bn and fell below $6tn. It was the largest decline between quarters since September 2011. In early January 2019, BlackRock announced plans to cut its workforce by 3 percent, or 500 positions, within weeks. In the same week, Fink promoted former senior managing director, Mark Wiedman, to head BlackRock’s international operations and corporate strategy. The promotion raised public speculation that Wiedman may be the heir to Fink, although the CEO had not confirmed plans to step down. For the fiscal year 2017, BlackRock reported earnings of US$4.970 billion, with an annual revenue of US$12.491 billion, an increase of 12.0% over the previous fiscal cycle. BlackRock's shares traded at over $414 per share, and its market capitalization was valued at over US$61.7 billion in October 2018. As of 2018, BlackRock ranked 237 on the Fortune 500 list of the largest United States corporations by revenue. BlackRock's largest division is iShares, a family of over 800 exchange-traded funds (ETFs) that comprises more than $1 trillion in assets under management. iShares is the largest provider of ETFs in the U.S. and in the world. In 2000, BlackRock launched BlackRock Solutions, the analytics and risk management division of BlackRock, Inc. The division grew from the Aladdin System (which is the enterprise investment system), Green Package (which is the Risk Reporting Service) PAG (portfolio analytics) and AnSer (which is the interactive analytics). BlackRock Solutions (BRS) serves two roles within BlackRock. First, BlackRock Solutions is the in-house investment analytics and “process engineering” department for BlackRock which works with their portfolio management teams, risk and quantitative analysis, business operations and every other part of the firm that touches the investment process. Second, BlackRock Solutions (BRS) and the three primary divisions (which include risk management investment platform solutions, Financial Markets Advisory, and client solutions) are services that offered to institutional clients. As of 2013, the platform had nearly 2,000 employees. BlackRock differentiates itself from other asset managers by claiming its risk management is not separate. Risk management is the foundation and cornerstone of the firm's entire platform. Aladdin keeps track of 30,000 investment portfolios, including BlackRock's own along with those of competitors, banks, pension funds, and insurers. According to The Economist, as at December 2013, the platform monitors almost 7 percent of the world’s $225 trillion of financial assets. BlackRock Solutions was retained by the U. S. Treasury Department in May 2009 to manage the toxic mortgage assets (i.e. to analyze, unwind, and price) that were owned by Bear Stearns, AIG, Inc., Freddie Mac, Morgan Stanley, and other financial firms that were affected in the 2008 financial crisis . BlackRock offers access to a broad spectrum of alternative investments, including real assets, private equity, private credit, direct hedge funds, and hedge fund solutions, organized under BlackRock Alternative Investors. BAI represents over $170B in total AUM, making BlackRock the 6th largest alternatives manager globally. BlackRock has placed particular emphasis on expanding BAI in recent years, including strategies such as a new long-term private equity fund and the acquisitions of credit-manager Tennenbaum Capital Partners and the infrastructure business of midstream energy and power specialist First Reserve Corporation. In 2017, BlackRock expanded its presence in sustainable investing and environmental, social and corporate governance (ESG) with new staff and products both in USA and Europe with the aim to lead the evolution of the financial sector in this regard. BlackRock started using its weight to draw attention to environmental and diversity issues by means of official letters to CEOs and shareholder votes together with activist investors or investor networks like the Carbon Disclosure Project, which in 2017 backed a successful shareholder resolution for ExxonMobil to act on climate change. In 2018, it asked Russell 1000 companies to improve gender diversity on their board of directors if they had less than 2 women on them. Despite BlackRock's attempts to model itself as a sustainable investor, one report shows that BlackRock is the world’s largest investor in coal plant developers, holding shares worth $11 billion among 56 coal plant developers. Another report shows that BlackRock owns more oil, gas, and thermal coal reserves than any other investor with total reserves amounting to 9.5 gigatonnes of CO2 emissions - or 30 percent of total energy-related emissions from 2017. In September, 2018, environmental groups including the Sierra Club,  and Amazon Watch  launched a campaign called BlackRock's Big Problem  which targets BlackRock as the "biggest driver of climate destruction on the planet" due in part to its being the largest owner of and its refusal to divest in companies that contribute to the climate crisis . On Wednesday January 17th, 2019, BlackRock responded to The Yes Men's  hoax annual letter  to investors that BlackRock would screen out businesses it invested in that did not comply with the goals of the Paris Climate Agreement. The fake letter went viral was reported on by the Financial Times before it was known to be fake . BlackRock was then put in the difficult position of having to deny claims in the letter that it would be divesting from fossil fuel companies, something environmentalists and shareholder activists have been requesting that it do . ^ a b Lim, Dawn. "BlackRock's assets fall below $6 trillion mark". MarketWatch. Retrieved 2019-01-24. ^ "Die grösste Schattenbank der Welt". Basler Zeitung. November 20, 2012. Retrieved May 8, 2017. ^ a b "Shadow and substance". The Economist. May 10, 2014. Retrieved May 8, 2017. ^ Appell, Douglas; Appell, Douglas (2012-07-09). "BlackRock departures spur talk about Fink's future". Pensions & Investments. Retrieved 2019-04-15. ^ "The rise of BlackRock". The Economist. 2013-12-05. ISSN 0013-0613. Retrieved 2019-04-15. ^ "Larry Fink Q&A: "I Don't Identify as Powerful"". www.bloomberg.com. Retrieved 2019-04-15. ^ a b Carey, David; Morris, John E. (2012). King of Capital: The Remarkable Rise, Fall, and Rise Again of Steve Schwarzman and Blackstone. Crown Publishing Group. p. 59. ISBN 9780307886026. ^ a b c d e "Schwarzman Says Selling BlackRock Was 'Heroic' Mistake". Bloomberg.com. September 30, 2013. Retrieved 17 November 2016. ^ a b c d "BlackRock: The $4.3 trillion force". Fortune. July 7, 2014. Retrieved May 9, 2017. ^ "Corporate History". Archived from the original on May 17, 2012. Retrieved 2014-03-22. ^ "BlackRock Acquiring State Street Research from MetLife". businesswire.com. August 24, 2004. ^ "BlackRock and a hard place". The Economist. February 16, 2006. Retrieved May 9, 2017. ^ Spence, John. "BlackRock, Merrill fund unit complete merger". MarketWatch. Retrieved 2019-04-11. ^ "BlackRock to Acquire Fund of Funds Business from Quellos Group, LLC" (PDF). 2007-06-26. BlackRock, Inc.
^ Andrews, Suzanna. Larry Fink’s $12 Trillion Shadow, Vanity Fair, April 2010: "There is little doubt among the financial establishment in Washington and on Wall Street that BlackRock was the best choice to handle the government’s problems." ^ "BlackRock to Acquire R3 Capital". The New York Times. April 17, 2009. Retrieved May 9, 2017. ^ "US giant BlackRock buys arm of Barclays bank | The Guardian". The Guardian. UK. Press Association. 12 June 2009. Retrieved 21 February 2010. ^ a b Kolhatkar, Sheelah (December 9, 2010). "Fink Builds BlackRock Powerhouse Without Goldman Sachs Backlash". Bloomberg. Retrieved April 20, 2013. ^ "BlackRock to join S&P 500 index, replacing Genzyme". Bloomberg Businessweek. 2011-03-29. Archived from the original on 2012-10-26. Retrieved January 23, 2012. ^ "Snapdeal raises $100M in fresh funding from BlackRock, Temasek, PremjiInvest, others". VC Circle. ^ "FCA Life Ban For Fare-Dodging Jonathan Burrows". Sky News. 15 December 2014. Retrieved 15 December 2014. ^ "Is BlackRock Too Big". Sovereign Wealth Fund Institute. n.d. Retrieved 9 February 2015. ^ "BlackRock profit falls as shift from stocks hits fee revenue". Reuters. 2016-07-14. Retrieved 2019-01-15. ^ a b "BlackRock to Acquire FutureAdvisor". BlackRock Press Releases. BlackRock. Retrieved 26 August 2015. ^ Tepper, Fitz (24 June 2015). "YC Alum FutureAdvisor Is Now Managing $600 Million In Assets". TechCrunch. Retrieved 12 September 2015. ^ Stevenson, Alexandra (2015-11-18). "BlackRock to Wind Down Macro Hedge Fund". The New York Times. ISSN 0362-4331. Retrieved 2015-11-19. ^ "BlackRock cuts ranks of stockpicking fund managers". Financial Times. 27 March 2017. Retrieved 30 March 2017. ^ Hamilton, Peter (May 8, 2017). "BlackRock increases stakes in CRH and Bank of Ireland". Irish Times. Retrieved May 8, 2017. ^ Foley, Stephen (April 19, 2017). "BlackRock assets under management hit $5.4tn on record ETF inflows". Financial Times. Retrieved May 10, 2017. ^ Hughes, Jennifer (April 20, 2017). "BlackRock backs mainland China shares for MSCI benchmarks". Financial Times. Retrieved May 10, 2017. ^ "BlackRock to cut 3 percent of its workforce in coming weeks: memo". Reuters. 2019-01-10. Retrieved 2019-01-15. ^ Lim, Dawn (2019-01-12). "BlackRock Elevates Potential Successor to CEO Laurence Fink". Wall Street Journal. ISSN 0099-9660. Retrieved 2019-01-15. ^ "Annual Reports & Proxy Statements | BlackRock". ir.blackrock.com. Retrieved 2018-11-18. ^ "BlackRock". Fortune. Retrieved 2018-11-25. ^ "BlackRock - Verwaltetes Vermögen bis 2017 | Statistik". Statista (in German). Retrieved 2018-10-30. ^ a b c Briefing: BlackRock - The Monolith And The Markets, The Economist, December 7, 2013, pp. 24-26. ^ Rappaport, Liz; Craig, Susanne (2009-05-19). "BlackRock Wears Multiple Hats". Wall Street Journal. ISSN 0099-9660. Retrieved 2019-01-24. ^ Chasan, Emily (2017-10-10). "BlackRock Names Former Obama Aide to Run Sustainable Investing". Bloomberg. ^ Jarsh, Melissa; Chasan, Emily (2018-06-13). "BlackRock, Wells Fargo Are Betting on Ethical Investing Funds for 401(k)s". Bloomberg. ^ "Independent Capital's Staub-Bisang to run BlackRock Switzerland". Reuters. 2018-10-19. ^ Andrew Winston (2018-01-19). "Does Wall Street Finally Care About Sustainability?". HBR. ^ Tarek Soliman (2017-06-01). "The new normal: Exxon shareholders vote in favour of climate action". ^ Gary McWilliams (2017-05-31). "Exxon shareholders approve climate impact report in win for activists". Reuters. ^ Chasan, Emily (2018-11-03). "BlackRock Is Sick of Excuses for Corporate Boards Lacking Women". Bloomberg. ^ Moyer, Liz (April 5, 2018). "BlackRock to offer new funds that exclude stocks of gun makers and retailers including Walmart". CNBC. Retrieved April 2, 2019. ^ Gibson, Kate (April 5, 2018). "BlackRock unveils line of gun-free investment products". CBS News. Retrieved April 2, 2019. ^ Siegel, Rachel (April 6, 2018). "BlackRock unveils gun-free investment options". The Washington Post. Retrieved April 2, 2019. ^ "New Research Reveals the Banks and Investors Financing the Expansion of the Global Coal Plant Fleet". Urgewald. 2018-12-05. ^ "New report confirms BlackRock's big fossil fuel problem". Friends of the Earth. 2018-12-10. ^ "New Campaign Is Calling Out BlackRock's Big Climate Problem". Sierra Club. 2018-10-05. Retrieved 2019-01-24. ^ "BlackRock Targeted as Largest Driver of Climate Destruction in New Campaign". Amazon Watch. Retrieved 2019-01-24. ^ a b "BlackRock's Big Problem | Making the climate crisis worse". BlackRock's Big Problem | Making the climate crisis worse. Retrieved 2019-01-24. ^ "The Yes Men". The Yes Men. Retrieved 2019-01-24. ^ "Larry Fink's Letter". The Yes Men. 2019-01-14. Retrieved 2019-01-24. ^ "The Fake Letter Gets Real". The Yes Men. 2019-01-14. Retrieved 2019-01-24. ^ "The Yes Men Target Fossil Fuel Ties of BlackRock Investment Firm". Democracy Now!. Retrieved 2019-01-24. Brooker, Katrina (October 29, 2008). "Can this man save Wall Street?". Fortune. Foley, Stephen (April 2, 2017). "BlackRock's active funds navigate rough seas". Financial Times.